The cabins are located one mile past the Grand Isle FISHING Bridge on Highway 1 to your left. Across the highway from the beach. For over a century Grand Isle, "The Cajun Bahamas has been home to Louisiana's premier fishing resort community, and access to a rich range of fishing tournaments, fresh seafood, and public beaches. And located in the heart of this Louisiana fishing mecca on Louisiana's only inhabited barrier island is Sun & Sand Cabins. Featuring 6 cabins with 2 private bedrooms, sleeps 6 people comfortably. Our 2 bedroom cabins has a full size bed in each bedroom & 2 single beds in the living area. Each cabin has a patio & picnic table, furnished kitchens with adjoining living area, full baths, central A.C./heat & DirecTv with sport channels. We provide linen, but no towels. Our common areas also offer 4 BBQ pits & a screened in fish and crab house with boiling equipment for cajun crabs, succulent shrimp or delicious Louisiana crawfish. Typically, our clients days are spent enjoying Gulf of Mexico's gentle surf or hiring an inland or coastal charter around Grand Isle's bays or coastal waters. If the open seas is not on your agenda, beach lovers and wade fishing enthusiasts find a virtual paradise on Grand Isle's public beaches. Or visit the Grand Isle State Park and discover the secrets of Grand Isle. Rent or hire a boat and visit historic Fort Livingston, the original hideout of legendary Pirate Jean Lafitte. Regardless of your interests, you're sure to find plenty to do on Grand Isle. The cabins are located one mile past the Grand Isle Bridge on Highway 1 to your left, across the highway from the beach. February 2013. One might not think that an activity like fishing would lend itself to a study in sociology, but just take a ride down Louisiana Highway 1 South to Grand Isle and see for yourself. There you will find the new and improved Grand Isle Bridge Fishing Pier lined with expectant anglers. But how, you might ask, is a fishing pier akin to a study in sociology? Recently rebuilt, this fishing pier has become a gathering place for fisher folks from all walks of life and many nationalities. On any given day or night, you might find Cajuns, Native Americans, Latinos, and Asians fishing there, side by side. However, the variety is not only one of nationalities; it’s also one of age. From children to great-grandparents, everyone is welcome and comfortable fishing from the Grand Isle pier. Everyone on the pier fishes together in safety, even into the wee hours of the morning, exhibiting camaraderie natural among fishermen. Whether fishing day or night, this wide variety of anglers generously swap fishing stories and share fishing tips, bait, and tackle. Fishing has become their common bond, breaking through racial and language barriers. However, if fishing isn’t your forte’, preferring instead to catch blue crab, then you’re in the right place. Most folks have great success in catching champagne baskets full of the southern delicacies from the pier, using long nets baited with chicken necks. With ample parking on either side of the bridge, and a fully-equipped marina within walking distance, everything you might need for an enjoyable fishing trip may be purchased there. If you prefer, you may bring an ice chest loaded down with your favorite fishing foods and soft drinks, making this an affordable way to put fish on the table. Most commonly, folks take home red fish (red drum), black drum, flounder, and speckled trout. The red fish, black drum, and flounder are most often caught fishing on the bottom with a Carolina rig and dead shrimp, cracked crab, or cut bait. The trout, however, are usually caught using dead shrimp or artificial lures and a line rigged with a “popping cork.” If by chance you don’t have the right bait, don’t fret, because the nearby marina sells every type of bait you might need to catch these fish. 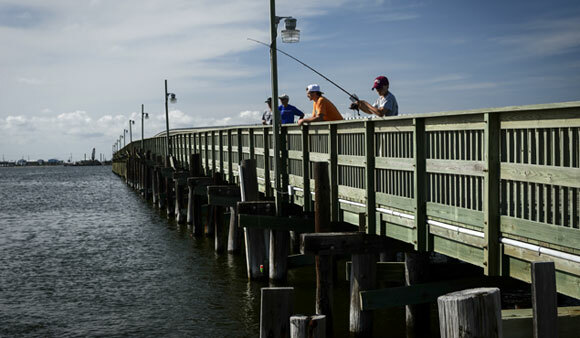 If you don’t own a boat and are looking for just the right place to fish, any season, any time of day or night, then the Grand Isle Bridge Fishing Pier is just the place. As a day trip from New Orleans, Baton Rouge, or Lafayette, it just doesn’t get any easier or more enjoyable. If you prefer to spend the night, there are plenty of places on Grand Isle with overnight accommodations—some equipped with kitchenettes and outside facilities where you can easily cook your catch and reap the rewards of your successful fishing trip right away. So, what are you waiting for? Load up the family and head down La. 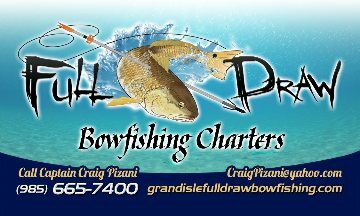 1 and have yourself some fishing fun in 2013!